We close our sermon series – Got Prayer? – with a word about how you should pray, but I don’t know if it’s what you think it is. Hopefully this message will offer something to think about. Eyes open or eyes closed? When you pray, if you pray, do you do it with your eyes open or closed? I think most people’s gut reaction is to say with our eyes closed. But there are times you might pray with your eyes open. Like when I’m driving. I think if I’m praying while driving, it honors God a lot more to do it with my eyes open than closed. I ask this question because someone once asked it of me and it really got me thinking about prayer. Was there a right way to pray? I guess I had taken it for granted that there were certain “rules” about prayer, but were those assumptions right? The person who asked me was a friend of mine I knew while working at another church. I don’t know what inspired him to ask, but he shared that he always prayed with his eyes open and wondered what the rest of us did. I had never heard of that before. 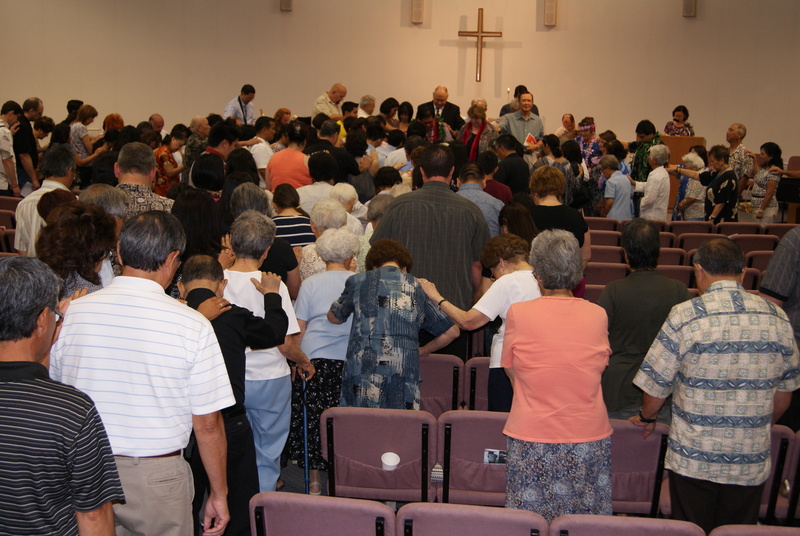 Like I said, there were occasions when I WOULD pray with my eyes open, like while driving a car, but overall I just assumed most people prayed with their eyes closed. I wish I had asked him why he did it that way. I imagine because when we’re talking to someone it would be considered impolite not to look at them. It makes them feel as if we don’t care. There was a study done of patient complaints at a large hospital and they found this exact result. They said, “9 out of 10 letters included mention of poor doctor-patient eye contact; a failure which was generally interpreted as ‘lack of caring.’” Plus, eye contact “produces a powerful, subconscious sense of connection” and those who seek eye contact are “judged to be more believable, confident, and competent.” After all, prayer is simply conversation with God. Prayer is simply conversation with God. 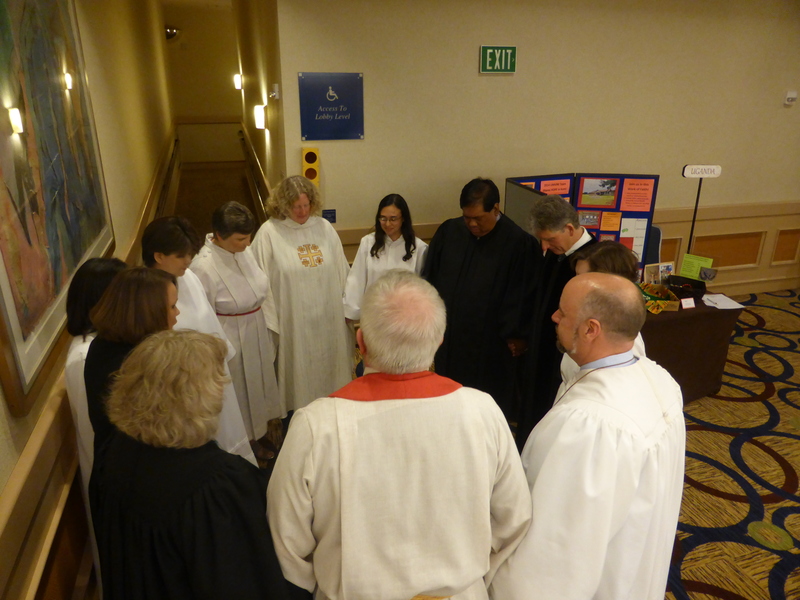 One of the most meaningful times of prayer I’ve shared in – with my fellow ordinands before being ordained! I mean, as much as we want to believe that Jesus is our friend, we’re still talking about the creator of the universe. Sometimes I think averting our eyes has more to do with respect and/or the overwhelming nature of God than anything else. Remember when Moses wanted to look upon God? He asked God to show him his glory and God said, “Okay, but I’m going to shield you with my hand until I pass by and then you can look at me from behind because no one can look upon me face-to-face and live.” God wasn’t threatening Moses, he was looking out for him. God is just so far beyond our comprehension that to stare at God directly would drive the average person insane. When I try to think of an apt analogy, I think about the book of Revelation, probably the scariest, weirdest and at the same time most hopeful book in the Bible. It’s got all of these bizarre images of the sun being blacked out and Jesus with a sword coming out of his mouth and just tons of unbelievable pictures that John writes down. But John was doing his best to interpret what he was seeing the best way he could. The reality of God is so far beyond human comprehension this is the best we could do. So whether you pray with your eyes open or your eyes shut is really a matter of perspective and choice. The same with your posture. The way you position your body doesn’t really matter. In fact, the Bible doesn’t advocate for one way or another. Daniel, the guy who literally got thrown to the lions, used to get down on his knees three times a day to pray and give thanks to God (Daniel 6:10) whereas according to Mark (Mark 11), Jesus refers to people standing up to pray. And Jesus himself lay flat down on his face in the Garden of Gethsemane to pray (Matthew 26:39). None are said to be more effective or more “right” than the others. And what should you do with your hands? Do you interlock your fingers or do you pray with your palms facing one another and your fingers touching? Maybe you pray with your hands raised to God or you lie them flat on the ground. When I was a kid, I used to think about those things and I wondered if maybe because my head was bent down when I prayed and my head was usually pointed toward my hands that my brain waves were being channeled from my hands straight up to Heaven. Like an antenna for God. So is there a right way to pray? There is. But it’s probably not what you think when you first hear this question. If you would open your Bible or your Bible app to Matthew 6 beginning with verse 9. Matthew 6:9. This is what we most often refer to as “The Lord’s Prayer” but I’ve also heard it called the “Our Father” which is always baffling to me. Not the “Our Father Prayer” but the “Our Father” as if everyone should know already what that is (side note: danger of church-y words used to show how “in” we are). So even before we start praying we have differences. But when you read this prayer, you’ll notice some slight differences from what we typically say in church. This prayer and the one we read earlier in Luke are different. The one in Luke is shorter. It doesn’t say “your will be done on earth as it is in heaven” as it does here in verse 10. And in verse 12 we ask God to forgive our debts and we forgive our debtors, but in Luke we ask God to forgive our sins. Luke’s version doesn’t mention at all deliverance from evil. So did Luke leave a bunch of stuff out? And what about the line, “Yours is the kingdom and the power and the glory forever. Amen?” How come neither of them say it? It turns out that last line of The Lord’s Prayer is called a doxology, like we sing after the offering. A doxology is simply a short verse of praise to God to sort of wrap up the prayer. It’s a good way to remind ourselves who is truly the focus of our prayer – God. And it was common for prayers to end with a doxology. It happens in the Bible quite often. But if Jesus didn’t say it, then does that mean we shouldn’t? I love this book and it’s a great resource. Sad to hear it’s no longer in print. The Jesus of the Bible is still available by 3rd party sellers on Amazon. The problem with The Lord’s Prayer is Jesus didn’t mean for it to be a script. He didn’t literally mean there was only one script we should use to pray to God. Can you imagine how boring that would be for him? Sure we say it every week, but when we read examples of Jesus’ prayers to God, they don’t sound like this at all. Jesus prayed when he raised Lazarus. Jesus prayed in the Garden of Gethsemane. Jesus prayed on the cross. And each one of these prayers was vastly different from the others and all of them were different than what he taught us to say in this passage. That’s because Jesus was giving us a rubric for how to say a prayer, not what the prayer should actually be. The Lord’s Prayer is a rubric for prayer, and not the exact words that a prayer should be. Stephen Miller, in his book The Jesus of the Bible writes something quite prolific. He wrote, “What’s troubling to some Christians today is that Jesus’ example of what prayer should be – a conversation with God – has become an example of what prayer should not be: mindless repetition.” Jesus’ example of what prayer should be – a conversation with God – has become an example of what prayer should not be: mindless repetition. How many times have you said The Lord’s Prayer without giving it a second thought? How many of you were pressured or forced to remember it to pass a test or to feel like you fit in? Don’t get me wrong. The Lord’s Prayer is extremely important, but more for what it can teach us than for exactly what it says. The Lord’s Prayer helps us to focus on God. It’s too easy to just come to God with a laundry list of things. God isn’t someone who responds to “honey do” lists. Instead Jesus is trying to get us to focus on God and fulfilling God’s will. To help us understand how much we rely on God and not to take God for granted. The first part of the prayer is all about lifting praise and glory to God. “Hallowed be thy name / Thy kingdom come, they will be done.” We’re lifting up glory to God and hoping our actions and our words move us toward fulfilling God’s will. And then we move into the asking part. But I think if you read it carefully, you’ll see that it’s not so much asking, as reminding us whom we need to rely on. “Give us this day our daily bread.” “Forgive us our trespasses,” sounds like we’re demanding God do something for us. “Hey, God! Give me some bread!” But really these are subtle reminders that God is in charge. Only God can forgive sins. Only God created the animals and plants we rely on for food. Then we are reminded how much we need to forgive others as God has forgiven us. And finally we ask God to, “Lead us not into temptation but deliver us from evil,” because without God’s help, we will delve right into our own selfish and sinful ways. All of it, the entirety of the prayer is to remind us that it is by the grace and love of God that we are who we are. Prayer is more about attitude than aptitude. Prayer is more about attitude than aptitude. It isn’t about the exact words you use. It’s about communicating with God from the heart. It isn’t about the way your body is positioned. It’s about approaching God with gratitude and trust. Too often in our conversations with God, we do all the talking. Maybe we should listen more. I have to give my parents credit. They indulged my love of reading and let me read a lot! They bought me tons of books, brought me regularly to the library, and trusted me to know what was appropriate and what wasn’t. They even let me read Judy Blume books. I read the “boy” books like Tales of a Fourth Grade Nothing and Superfudge. But they also let me read stuff like Are You There God? It’s Me, Margaret. I didn’t know that was revolutionary except that whenever I mention it people are surprised and sometimes shocked. But it was the first time I read a book about a kid who prayed. It meant a lot to me. We could talk all day long about the theology of the book, but it was my first introduction to a God who listened and cared about what I had to say. A God who was patient as we tried to figure out what role God played in our lives. And a God who just wants us to come back and talk with him. Is there a right way to pray? Yes, but it’s not about form or function. The right way to pray is to do it often and from the heart. The rest will come in time. In the name of the Father and of the Son and of the Holy Spirit. Amen. 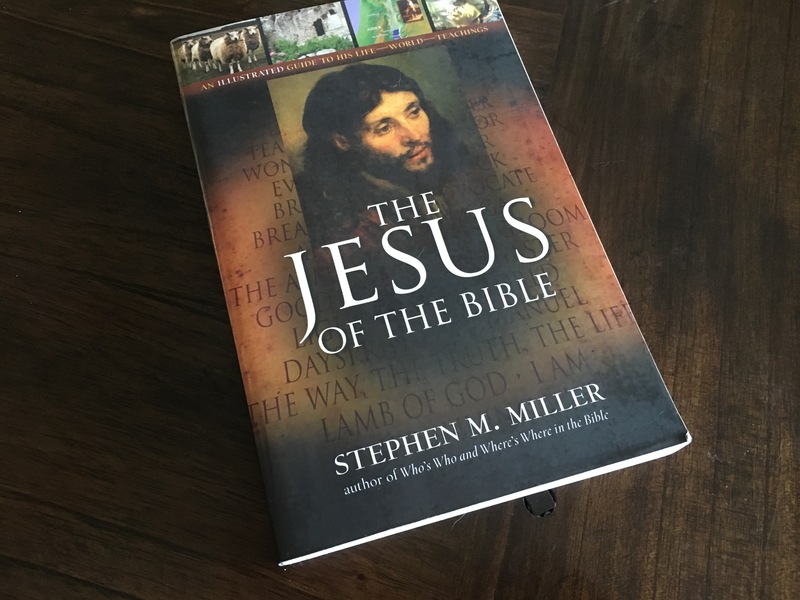 Stephen Miller, The Jesus of the Bible, (Barbour Publishing, OH), 2009, p. 176.